84 Commercial Real Estate and Properties in Canberra South are listed in 6 categories. We have 73 Offices for Sale & Lease , 41 Industrial Warehouses for Sale & Lease , 12 Retail Shops for Sale & Lease , 4 Showrooms for Sale & Lease , 2 Medical and Consulting Properties for Sale & Lease and 2 Development Lands for Sale & Lease . Abundance Of Natural Light | Malls Nearby | Free Parking $253pw | 4 Person Workspa..
PROPERTY OVERVIEW $253pw Price incl. Large unfurnished office in the leafy suburb of Kambah. This space is as good as your own lease as you can secure a 12 person open plan workspace, three smaller private offices and a large private boardroom at a way lower cost on a more flexible commitment. There are also options to split the space up for smaller teams. It boasts great levels of natural light through large windows on three sides to encourage productivity and creative thinking throughout your business. There is a range of storage space and some furniture including desks, partitions and whiteboards if they’re needed. There are also print/scan facilities and the space can be securely accessed 24 hours a day. Perfect for businesses in the service industry that require their own private space, this office represents an incredibly affordable and agile alternative to a costly long term lease. Located in the heart of Kambah, this large office space has parking, great transport links and fab convenience to amenities. The building is split into four units and the tenants together have shared access to toilets and a generous kitchen/breakout area. It has a large shared car park and street parking is also easy to find on Kett Street. This excellent location is in between the Burns Club and Kambah shops, including Woolworths and lots of specialty shops for great day to day convenience, and the building enjoys a lovely tranquil outlook over the Kambah playing fields. It’s situated just off the Tuggeranong Parkway so a journey to Canberra takes just 15 minutes and, even better, you beat all the traffic as you’re travelling away from the city in the morning and towards it in the evening. Life is easier working in Tuggeranong and you’ll love the tranquil green filled area that surrounds this Kumbah office space. The advertised office space is perfect for a team of 4. If you need more or less space, we have over 30,000 furnished workspaces all over the world suitable for a team of 1 to 200+. Our award winning team offer a free service that will help you find the perfect solution for your needs, so reach out if you need more help. What you get for your weekly rent , 24/7 Access , 24/7 Security , Access to internal breakout areas , Access to kitchen facilities , Access to secure printer and scanner , Building outgoings included , Electricity usage included , Lockable storage unit , High speed Internet Building features , Abundance of natural light , Air conditioning , Car parking in building (Free) , Car parking Street (Free) , Gym and fitness centre close by , Print, scan and copy facilities , Retail and shopping malls nearby 250m to Woolworths 150m to Burns Club buffet Direct access to gym and day care centre 200m Tuggeranong Parkway, giving access to the city WHO IS OFFICE HUB? Office Hub has largest collection of shared office space, sublet office space, creative coworking office space and serviced offices, perfect for 1 200 employees. Let us take you on a tour of all the spaces that fit your needs and budget. Our service is complimentary and we work for you and the landlord to negotiate the most competitive deal in the market. Let us show you how shared and serviced offices can be the perfect solution for your business. www.office hub.com.au www.office hub.co.nz Conditions apply A portion of the square meterage factors in access to shared space. The advertised price includes any incentives offered based on a 12 month agreement. If a shorter period is agreed to please note the price may increase accordingly. This promotional offer for new tenants only and may be withdrawn at any time due to space availability. Ideal Location | Premium Grade Office Space | Abundance Of Natural Light $67pw | 1 Person Workspac..
PROPERTY OVERVIEW $67pw Price incl. Polished and professional managed space in affluent Barton location close to Canberra's Parliament House. Price includes: Commercial grade internet | Access to meeting and boardrooms | Flexible terms | Access to internal breakout areas | Business lounge | Professional environment | Stunning Reception | Great Natural Light | Premium Serviced Office | A Grade fit out Located and at the footsteps of Parliament House and Government Departments in one of Canberra's newest five star buildings, 18 National Circuit is also nearby Australia's most iconic attractions. The National Gallery of Australia, National Library of Australia, National Portrait Gallery, Questacon Award winning Hotel Realm and Burbury Hotel are all close The advertised office space is perfect for a team of 1. If you need more or less space, we have over 30,000 furnished workspaces all over the world suitable for a team of 1 to 200+. Our award winning team offer a free service that will help you find the perfect solution for your needs, so reach out if you need more help. What you get for your weekly rent A prestigious address for your business cards Mail and courier management services Local phone number and dedicated receptionist 3 hours /day FREE use of Coworking lounges worldwide 3 days /mth FREE use of private offices outside your city Access to boardrooms and meeting rooms worldwide Access to secretarial and IT support Signage board in foyer to highlight your business name Secure high speed WiFi in Coworking lounges and private offices Electricity usage included Flexible terms from 1 month to long term Ability to bring your existing phone number over No security deposit when you sign with credit card Book all facilities and view bills online or on our apps First month is FREE, no further obligation Building features Modern high rise classified as an "A" grade building Immaculate fit out and facilities 24 x 7 security High speed lifts Car parking in building and surrounding areas Dedicated on site management team Available on a pay as you go basis when you need it Non accumulative and subject to availability 30m to Bus 50m to Gym, Pub and Shopping Centre 5m to Park Ideal location, with everything close by! WHO IS OFFICE HUB? Office Hub is Australia & New Zealand\'s No 1 small office space commercial real estate agency. We have the largest collection of shared spaces, coworking and serviced offices in Australia & New Zealand, perfect for 1 100 employees. Let us take you on a tour of all the spaces that fit your needs and budget. Our service is complimentary and we work for you and the landlord to negotiate the most competitive deal in the market. Let us show you how shared and serviced offices can be the perfect solution for your business. www.office hub.com.au www.office hub.co.nz Conditions apply A portion of the square meterage factors in access to shared space. Price includes any incentives offered. This is for new tenants only. Abundance Of Natural Light | Cafes And Shops Nearby | Free Meeting Rooms $74pw | 1 Person Workspac..
PROPERTY OVERVIEW $74pw Price incl. Large commercial office in Phillip offering a range of private and coworking spaces for rent. With flexible terms and multiple workspace options, there is heaps of potential here for businesses of all sizes – it could be rented by a 15 person team to make it their very own private office or by multiple individuals and small businesses in a shared working scenario. The workspace harbours a traditional office look with partitioned coworking areas, spacious private offices and comfortable sofa areas with plenty of office furniture and storage units provided. Commercial grade internet is already setup and the advertised rate covers every cost to do with the space – no need to worry about upfront costs or legal fees with this simple agreement. Meeting rooms can be used freely, the whole space is regularly cleaned and there is a large kitchen space where you can relax on breaks. Affordable and generous, this office space could be the perfect home for your business – enquire today to explore the options and arrange a move in date to suit you. This striking commercial building is placed in the centre of Woden just steps from the action at Westfield Woden Shopping Centre. It’s prominently positioned and features three lifts, basement parking and a recently renovated foyer for a great professional look. Plus it enjoys a wonderful northerly aspect with fantastic views towards Canberra to keep you inspired all day long. The setting is ideal for anyone wanting to work in Canberra’s southern suburbs – it’s 100m from a wide range of amenities and services at Westfield Woden, a couple of kilometres from the Tuggeranong Parkway, 7.3km from Parliament Circle and just over 10km to Civic. The advertised office space is perfect for a team of 1. If you need more or less space, we have over 30,000 furnished workspaces all over the world suitable for a team of 1 to 200+. Our award winning team offer a free service that will help you find the perfect solution for your needs, so reach out if you need more help. What you get for your weekly rent , 24/7 Access , 24/7 Security , Access to kitchen facilities , Building outgoings included , Commercial grade internet (Free) , Electricity usage included , Flexible terms , FREE use of the meeting rooms , Plug and play furnished workspace , Regular cleaning Building features , Abundance of natural light , Air conditioning , Car parking Street / Public Car Park (Paid) , Dedicated men and ladies bathrooms , Direct access to public transport , End of trip facilities e.g showers, bike racks , Onsite Cafe / Restaurant , Professional working environment 10m to Woden Bus Interchange 50m to Westfield Woden 10min to Canberra CBD Close to shops, cafes, restaurants, bars in fact everything! WHO IS OFFICE HUB? Office Hub is Australia & New Zealand\'s No 1 small office space commercial real estate agency. We have the largest collection of shared spaces, coworking and serviced offices in Australia & New Zealand, perfect for 1 100 employees. Let us take you on a tour of all the spaces that fit your needs and budget. Our service is complimentary and we work for you and the landlord to negotiate the most competitive deal in the market. Let us show you how shared and serviced offices can be the perfect solution for your business. www.office hub.com.au www.office hub.co.nz Conditions apply A portion of the square meterage factors in access to shared space. Price includes any incentives offered. This is for new tenants only. Free Meeting Rooms | Transport Close By | Abundance Of Natural Light $190pw | 2 Person Workspa..
PROPERTY OVERVIEW $190pw Price incl. Large commercial office in Phillip offering a range of private and coworking spaces for rent. With flexible terms and multiple workspace options, there is heaps of potential here for businesses of all sizes – it could be rented by a 15 person team to make it their very own private office or by multiple individuals and small businesses in a shared working scenario. The workspace harbours a traditional office look with partitioned coworking areas, spacious private offices and comfortable sofa areas with plenty of office furniture and storage units provided. Commercial grade internet is already setup and the advertised rate covers every cost to do with the space – no need to worry about upfront costs or legal fees with this simple agreement. Meeting rooms can be used freely, the whole space is regularly cleaned and there is a large kitchen space where you can relax on breaks. Affordable and generous, this office space could be the perfect home for your business – enquire today to explore the options and arrange a move in date to suit you. This striking commercial building is placed in the centre of Woden just steps from the action at Westfield Woden Shopping Centre. It’s prominently positioned and features three lifts, basement parking and a recently renovated foyer for a great professional look. Plus it enjoys a wonderful northerly aspect with fantastic views towards Canberra to keep you inspired all day long. The setting is ideal for anyone wanting to work in Canberra’s southern suburbs – it’s 100m from a wide range of amenities and services at Westfield Woden, a couple of kilometres from the Tuggeranong Parkway, 7.3km from Parliament Circle and just over 10km to Civic. The advertised office space is perfect for a team of 2. If you need more or less space, we have over 30,000 furnished workspaces all over the world suitable for a team of 1 to 200+. Our award winning team offer a free service that will help you find the perfect solution for your needs, so reach out if you need more help. What you get for your weekly rent , 24/7 Access , 24/7 Security , Access to kitchen facilities , Building outgoings included , Commercial grade internet (Free) , Electricity usage included , Flexible terms , FREE use of the meeting rooms , Plug and play furnished workspace , Regular cleaning Building features , Abundance of natural light , Air conditioning , Car parking Street / Public Car Park (Paid) , Dedicated men and ladies bathrooms , Direct access to public transport , End of trip facilities e.g showers, bike racks , Onsite Cafe / Restaurant , Professional working environment 10m to Woden Bus Interchange 50m to Westfield Woden 10min to Canberra CBD Close to shops, cafes, restaurants, bars in fact everything! WHO IS OFFICE HUB? Office Hub is Australia & New Zealands No 1 small office space commercial real estate agency. We have the largest collection of shared spaces, coworking and serviced offices in Australia & New Zealand, perfect for 1 200 employees. Let us take you on a tour of all the spaces that fit your needs and budget. Our service is complimentary and we work for you and the landlord to negotiate the most competitive deal in the market. Let us show you how shared and serviced offices can be the perfect solution for your business. www.office hub.com.au www.office hub.co.nz Conditions apply A portion of the square meterage factors in access to shared space. Price includes any incentives offered. This is for new tenants only. Excellent Lighting | Modern Utilities | Fitted And Furnished $1688pw | 31 Person Works..
PROPERTY OVERVIEW $1688pw Price incl. Large unfurnished office in the leafy suburb of Kambah. This space is as good as your own lease as you can secure a 12 person open plan workspace, three smaller private offices and a large private boardroom at a way lower cost on a more flexible commitment. There are also options to split the space up for smaller teams. It boasts great levels of natural light through large windows on three sides to encourage productivity and creative thinking throughout your business. There is a range of storage space and some furniture including desks, partitions and whiteboards if they’re needed. There are also print/scan facilities and the space can be securely accessed 24 hours a day. Perfect for businesses in the service industry that require their own private space, this office represents an incredibly affordable and agile alternative to a costly long term lease. Located in the heart of Kambah, this large office space has parking, great transport links and fab convenience to amenities. The building is split into four units and the tenants together have shared access to toilets and a generous kitchen/breakout area. It has a large shared car park and street parking is also easy to find on Kett Street. This excellent location is in between the Burns Club and Kambah shops, including Woolworths and lots of specialty shops for great day to day convenience, and the building enjoys a lovely tranquil outlook over the Kambah playing fields. It’s situated just off the Tuggeranong Parkway so a journey to Canberra takes just 15 minutes and, even better, you beat all the traffic as you’re travelling away from the city in the morning and towards it in the evening. Life is easier working in Tuggeranong and you’ll love the tranquil green filled area that surrounds this Kumbah office space. The advertised office space is perfect for a team of 31. If you need more or less space, we have over 30,000 furnished workspaces all over the world suitable for a team of 1 to 200+. Our award winning team offer a free service that will help you find the perfect solution for your needs, so reach out if you need more help. What you get for your weekly rent , 24/7 Access , 24/7 Security , Access to internal breakout areas , Access to kitchen facilities , Access to secure printer and scanner , Building outgoings included , Electricity usage included , Lockable storage unit , High speed Internet Building features , Abundance of natural light , Air conditioning , Car parking in building (Free) , Car parking Street (Free) , Gym and fitness centre close by , Print, scan and copy facilities , Retail and shopping malls nearby 250m to Woolworths 150m to Burns Club buffet Direct access to gym and day care centre 200m Tuggeranong Parkway, giving access to the city WHO IS OFFICE HUB? Office Hub has largest collection of shared office space, sublet office space, creative coworking office space and serviced offices, perfect for 1 200 employees. Let us take you on a tour of all the spaces that fit your needs and budget. Our service is complimentary and we work for you and the landlord to negotiate the most competitive deal in the market. Let us show you how shared and serviced offices can be the perfect solution for your business. www.office hub.com.au www.office hub.co.nz Conditions apply A portion of the square meterage factors in access to shared space. The advertised price includes any incentives offered based on a 12 month agreement. If a shorter period is agreed to please note the price may increase accordingly. This promotional offer for new tenants only and may be withdrawn at any time due to space availability. Abundance Of Natural Light | Free Meeting Rooms | Bike Racks & Showers $253pw | 4 Person Workspa..
PROPERTY OVERVIEW $253pw Price incl. Large commercial office in Phillip offering a range of private and coworking spaces for rent. With flexible terms and multiple workspace options, there is heaps of potential here for businesses of all sizes – it could be rented by a 15 person team to make it their very own private office or by multiple individuals and small businesses in a shared working scenario. The workspace harbours a traditional office look with partitioned coworking areas, spacious private offices and comfortable sofa areas with plenty of office furniture and storage units provided. Commercial grade internet is already setup and the advertised rate covers every cost to do with the space – no need to worry about upfront costs or legal fees with this simple agreement. Meeting rooms can be used freely, the whole space is regularly cleaned and there is a large kitchen space where you can relax on breaks. Affordable and generous, this office space could be the perfect home for your business – enquire today to explore the options and arrange a move in date to suit you. This striking commercial building is placed in the centre of Woden just steps from the action at Westfield Woden Shopping Centre. It’s prominently positioned and features three lifts, basement parking and a recently renovated foyer for a great professional look. Plus it enjoys a wonderful northerly aspect with fantastic views towards Canberra to keep you inspired all day long. The setting is ideal for anyone wanting to work in Canberra’s southern suburbs – it’s 100m from a wide range of amenities and services at Westfield Woden, a couple of kilometres from the Tuggeranong Parkway, 7.3km from Parliament Circle and just over 10km to Civic. The advertised office space is perfect for a team of 4. If you need more or less space, we have over 30,000 furnished workspaces all over the world suitable for a team of 1 to 200+. Our award winning team offer a free service that will help you find the perfect solution for your needs, so reach out if you need more help. What you get for your weekly rent , 24/7 Access , 24/7 Security , Access to kitchen facilities , Building outgoings included , Commercial grade internet (Free) , Electricity usage included , Flexible terms , FREE use of the meeting rooms , Plug and play furnished workspace , Regular cleaning Building features , Abundance of natural light , Air conditioning , Car parking Street / Public Car Park (Paid) , Dedicated men and ladies bathrooms , Direct access to public transport , End of trip facilities e.g showers, bike racks , Onsite Cafe / Restaurant , Professional working environment 10m to Woden Bus Interchange 50m to Westfield Woden 10min to Canberra CBD Close to shops, cafes, restaurants, bars in fact everything! WHO IS OFFICE HUB? Office Hub is Australia & New Zealands No 1 small office space commercial real estate agency. We have the largest collection of shared spaces, coworking and serviced offices in Australia & New Zealand, perfect for 1 200 employees. Let us take you on a tour of all the spaces that fit your needs and budget. Our service is complimentary and we work for you and the landlord to negotiate the most competitive deal in the market. Let us show you how shared and serviced offices can be the perfect solution for your business. www.office hub.com.au www.office hub.co.nz Conditions apply A portion of the square meterage factors in access to shared space. Price includes any incentives offered. This is for new tenants only. PROPERTY OVERVIEW $253pw Price incl. Large unfurnished office in the leafy suburb of Kambah. This space is as good as your own lease as you can secure a 12 person open plan workspace, three smaller private offices and a large private boardroom at a way lower cost on a more flexible commitment. There are also options to split the space up for smaller teams. It boasts great levels of natural light through large windows on three sides to encourage productivity and creative thinking throughout your business. There is a range of storage space and some furniture including desks, partitions and whiteboards if they’re needed. There are also print/scan facilities and the space can be securely accessed 24 hours a day. Perfect for businesses in the service industry that require their own private space, this office represents an incredibly affordable and agile alternative to a costly long term lease. Located in the heart of Kambah, this large office space has parking, great transport links and fab convenience to amenities. The building is split into four units and the tenants together have shared access to toilets and a generous kitchen/breakout area. It has a large shared car park and street parking is also easy to find on Kett Street. This excellent location is in between the Burns Club and Kambah shops, including Woolworths and lots of specialty shops for great day to day convenience, and the building enjoys a lovely tranquil outlook over the Kambah playing fields. It’s situated just off the Tuggeranong Parkway so a journey to Canberra takes just 15 minutes and, even better, you beat all the traffic as you’re travelling away from the city in the morning and towards it in the evening. Life is easier working in Tuggeranong and you’ll love the tranquil green filled area that surrounds this Kumbah office space. The advertised office space is perfect for a team of 4. If that\'s not quite right, we have ready to use workspaces of all sizes all over the world and our free service will help you find the perfect solution for your needs. What you get for your weekly rent , 24/7 Access , 24/7 Security , Access to internal breakout areas , Access to kitchen facilities , Access to secure printer and scanner , Building outgoings included , Electricity usage included , Lockable storage unit , High speed Internet Building features , Abundance of natural light , Air conditioning , Car parking in building (Free) , Car parking Street (Free) , Gym and fitness centre close by , Print, scan and copy facilities , Retail and shopping malls nearby 250m to Woolworths 150m to Burns Club buffet Direct access to gym and day care centre 200m Tuggeranong Parkway, giving access to the city WHO IS OFFICE HUB? Office Hub has largest collection of shared office space, sublet office space, creative coworking office space and serviced offices, perfect for 1 200 employees. Let us take you on a tour of all the spaces that fit your needs and budget. Our service is complimentary and we work for you and the landlord to negotiate the most competitive deal in the market. Let us show you how shared and serviced offices can be the perfect solution for your business. www.office hub.com.au www.office hub.co.nz Conditions apply A portion of the square meterage factors in access to shared space. The advertised price includes any incentives offered based on a 12 month agreement. If a shorter period is agreed to please note the price may increase accordingly. This promotional offer for new tenants only and may be withdrawn at any time due to space availability. Fitted And Furnished | Abundance Of Natural Light | Ideal Location $1100pw | 4 Person Worksp..
PROPERTY OVERVIEW $1100pw Price incl. Light, stylish and professional space in Barton for medical and health based businesses. This building has two spare 20sqm medical offices available to be rented together or separately. With plenty of room in each office, you can move all your equipment in and enjoy a fresh and clean environment in which to welcome clients and treat patients. Included in the rent is 24/7 access, secure high speed internet, printing & scanning and the services of the onsite reception team to take calls and messages for you. As well as your light filled dedicated space, you have access to a shared kitchen and bathroom facilities and all are regularly cleaned and well maintained. Key benefits will be gaining unlimited networking and referral opportunities and an exciting sociable atmosphere as you work within a whole community of commercial health businesses. This is the perfect opportunity for medical, psychology, physiotherapy, massage, alternative health, holistic wellness and other practices in similar health related sectors. Flexible short and long term rentals available – enquire today! This first floor office space in Barton sits within a modern mixed use development filled with health and professional services businesses. It’s right behind the Realm Hotel and Burberry Hotel in the heart of Barton where you can enjoy a range of popular cafes, restaurants and amenities. Perfectly positioned between the City, Manuka and Kingston, this office sets you up in a midway point for all your clients plus gives you great access to the Parliamentary Precinct. The building is fully air conditioned with direct lift access from the carpack to the business door making it accessible and comfortable for patients – there are also 350 public car parks in the vicinity so parking will always be easy. The busy professional atmosphere is offset by plenty of greenery to create a feeling of wellbeing, adding to the totally picture perfect package for health businesses in Canberra. The advertised office space is perfect for a team of 4. If you need more or less space, we have over 30,000 furnished workspaces all over the world suitable for a team of 1 to 200+. Our award winning team offer a free service that will help you find the perfect solution for your needs, so reach out if you need more help. What you get for your weekly rent , 24/7 Access , Access to kitchen facilities , Access to secure printer and scanner , Collaborative space with a great community feel , Commercial grade internet , Regular cleaning , Secure high speed Internet , Your own receptionist and waiting area for your clients Building features , Air conditioning , Boutique low rise buidling , Car parking in building (Paid) , Car parking Street (Free) , Company Branding at reception , Company branding in foyer , Contemporary fit out , Dedicated men and ladies bathrooms , Direct access to public transport , Disabled access and facilities 7 minutes to Canberra hospital, 10 minutes to Calvary hospital and 1 minute to Barton Private 5 hotels within walking distance, restaurants, bars and cafes within walking distance also 3 minutes to Manuka 7 minutes from CBD, 10 minutes from Woden, 15 minutes from Belconnen 12 Minutes from the airport WHO IS OFFICE HUB? Office Hub has largest collection of shared office space, sublet office space, creative coworking office space and serviced offices, perfect for 1 200 employees. Let us take you on a tour of all the spaces that fit your needs and budget. Our service is complimentary and we work for you and the landlord to negotiate the most competitive deal in the market. Let us show you how shared and serviced offices can be the perfect solution for your business. www.office hub.com.au www.office hub.co.nz Conditions apply A portion of the square meterage factors in access to shared space. The advertised price includes any incentives offered based on a 12 month agreement. If a shorter period is agreed to please note the price may increase accordingly. This promotional offer for new tenants only and may be withdrawn at any time due to space availability. Enjoyable Working Environment | Fitted And Furnished | Economical Workspace $443pw | 7 Person Workspa..
PROPERTY OVERVIEW $443pw Price incl. Large unfurnished office in the leafy suburb of Kambah. This space is as good as your own lease as you can secure a 12 person open plan workspace, three smaller private offices and a large private boardroom at a way lower cost on a more flexible commitment. There are also options to split the space up for smaller teams. It boasts great levels of natural light through large windows on three sides to encourage productivity and creative thinking throughout your business. There is a range of storage space and some furniture including desks, partitions and whiteboards if they’re needed. There are also print/scan facilities and the space can be securely accessed 24 hours a day. Perfect for businesses in the service industry that require their own private space, this office represents an incredibly affordable and agile alternative to a costly long term lease. Located in the heart of Kambah, this large office space has parking, great transport links and fab convenience to amenities. The building is split into four units and the tenants together have shared access to toilets and a generous kitchen/breakout area. It has a large shared car park and street parking is also easy to find on Kett Street. This excellent location is in between the Burns Club and Kambah shops, including Woolworths and lots of specialty shops for great day to day convenience, and the building enjoys a lovely tranquil outlook over the Kambah playing fields. It’s situated just off the Tuggeranong Parkway so a journey to Canberra takes just 15 minutes and, even better, you beat all the traffic as you’re travelling away from the city in the morning and towards it in the evening. Life is easier working in Tuggeranong and you’ll love the tranquil green filled area that surrounds this Kumbah office space. The advertised work space is perfect for a team of 7. If you need more or less space we have furnished and unfurnished offices ready to go from 10sqm 200sqm all over Australia and New Zealand. What you get for your weekly rent , 24/7 Access , 24/7 Security , Access to internal breakout areas , Access to kitchen facilities , Access to secure printer and scanner , Building outgoings included , Electricity usage included , Lockable storage unit , High speed Internet Building features , Abundance of natural light , Air conditioning , Car parking in building (Free) , Car parking Street (Free) , Gym and fitness centre close by , Print, scan and copy facilities , Retail and shopping malls nearby 250m to Woolworths 150m to Burns Club buffet Direct access to gym and day care centre 200m Tuggeranong Parkway, giving access to the city WHO IS OFFICE HUB? Office Hub has largest collection of shared office space, sublet office space, creative coworking office space and serviced offices, perfect for 1 200 employees. Let us take you on a tour of all the spaces that fit your needs and budget. Our service is complimentary and we work for you and the landlord to negotiate the most competitive deal in the market. Let us show you how shared and serviced offices can be the perfect solution for your business. www.office hub.com.au www.office hub.co.nz Conditions apply A portion of the square meterage factors in access to shared space. The advertised price includes any incentives offered based on a 12 month agreement. If a shorter period is agreed to please note the price may increase accordingly. This promotional offer for new tenants only and may be withdrawn at any time due to space availability. Natural Light | Prestigious Location | Shared Workspace $253pw | 2 Person Workspa..
PROPERTY OVERVIEW $253pw Price incl. Cool and high quality Serviced office located next to Canberra Airport. Price incl. Internet, Rent & Building outgoings 24/7 Access Access to meeting and boardrooms Access to internal breakout areas Open plan layout Stunning Reception Located in the ultra modern Brindabella Business Park development, this A Grade building contains a mix of private offices and shared desks in an exciting, cutting edge work environment. Brightly lit and airy with access to NBN internet, this space is well positioned with restaurants, cafes and Canberra International Airport all nearby. The advertised office space is perfect for a team of 2. If you need more or less space, we have over 30,000 furnished workspaces all over the world suitable for a team of 1 to 200+. Our award winning team offer a free service that will help you find the perfect solution for your needs, so reach out if you need more help. What you get for your weekly rent , 24/7 Access , 24/7 Security , Access to internal breakout areas , Access to kitchen facilities , Building outgoings included , Commercial grade internet , Flexible terms , A prestigious address to put on your business cards , Worldwide access to boardrooms, meeting rooms and day offices , Plug and play furnished workspace Building features , Air conditioning , Conference facilities available , Dedicated men and ladies bathrooms , Modern fit out , Natural light , Open plan layout , Private offices , Professional environment , Shared office space , Quick access to major airports 7 minute drive to Majura shopping centre 3.5kms to IKEA Canberra 750m to Canberra Airport WHO IS OFFICE HUB? Office Hub has largest collection of shared office space, sublet office space, creative coworking office space and serviced offices, perfect for 1 200 employees. Let us take you on a tour of all the spaces that fit your needs and budget. Our service is complimentary and we work for you and the landlord to negotiate the most competitive deal in the market. Let us show you how shared and serviced offices can be the perfect solution for your business. All pricing shown excludes any local taxes such as GST or VAT Conditions apply A portion of the square meterage factors in access to shared space. The advertised price includes any incentives offered based on a 12 month agreement. If a shorter period is agreed to please note the price may increase accordingly. This promotional offer for new tenants only and may be withdrawn at any time due to space availability. Furnished 2-person Workspace With Unlimited Access To Coworking Breakout Areas Across The Servcorp Network All-inclusive $562 weekly.. Enjoy a fully furnished private office located in Canberra’s best address. Designed to be "plug and play", this space is fully furnished with all IT and communications infrastructure provided. The Nishi building is an award winning sustainable building in Canberra’s NewActon design precinct. The building boasts spectacular views across Lake Burley Griffin, the National Museum of Australia, the Telstra tower and the new Parliament House. Private sector building occupants include Clayton Utz, State Super and Molonglo Group. A number of Australian Commonwealth Government departments are also tenants, including The Department of Industry, Innovation and Science, and Safe Work Australia. What your weekly rent includes : • Fully furnished office with 24/7 access • Local phone number assigned with a dedicated receptionist to answer your calls • Impressive address on your website and collateral • High speed and secure Internet with 99.99% uptime • Connect with 40,000+ like minded business professionals • Community events to build your local network • Access to coworking and breakout areas • Modern kitchen facilities with complimentary coffee and tea • Pay as you go services including print facilities, administration and in house IT support. • Meeting room and boardroom access with member rates • Access to Servcorp's 160+ locations including 5 days free office usage outside your home state. Please contact us to arrange a tour today! 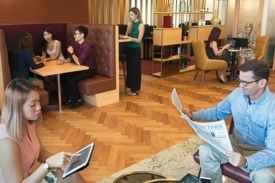 Note Photos are representative of the workspaces you immediately get access to as part of your Servcorp membership. Outgoings are not included in the weekly price. $513pw | 4 Person Workspa..
PROPERTY OVERVIEW $513pw Price incl. Professional serviced office in Kingston. Price incl. Internet, Telephone, Electricity & Kitchen Flexi terms Regular Cleaning 24/7 access Dedicated receptionist Trendy Canberra Location close to Parliament House Avail NOW for short or long term rent Located in Canberra's popular inner south between the Canberra railway station and the Kingston Powerhouse, this low rise boutique building is only an 8 minutes drive to the CBD. These new developments and the rise of a cafe culture have reformed Kingston as one of the most exclusive suburbs in Canberra. Located in Kingston, Canberra's oldest suburb, this space provides you with a professional and economical total office solution. The advertised work space is perfect for a team of 4. If you need more or less space we have furnished and unfurnished offices ready to go from 10sqm 200sqm all over Australia and New Zealand. What you get for your weekly rent Furnished office with desks, chairs and lock up storage units Complimentary receptionist to meet and greet your clients Unlimited commercial grade internet service Electricity usage included Regular cleaning Telephone number & handset Prestigious business address to put on your cards Flexible terms from 1 month 2 years Ability to bring your existing phone number over 24 x 7 access to your office 24 x 7 security Office features Views from selected offices Full mail management and postage Large boardroom and meeting rooms Signage board in foyer to highlight your business name (fees apply) Server / Comms rooms available for server storage Building features Modern building Food court in building Bike racks and shower facilities High speed lifts Car parking in building and surrounding areas Dedicated on site management team 100m to buses along Giles Street 600m to Canberra Train Station WHO IS OFFICE HUB? Office Hub is Australia & New Zealand\'s No 1 small office space commercial real estate agency. We have the largest collection of shared spaces, coworking and serviced offices in Australia & New Zealand, perfect for 1 100 employees. Let us take you on a tour of all the spaces that fit your needs and budget. Our service is complimentary and we work for you and the landlord to negotiate the most competitive deal in the market. Let us show you how shared and serviced offices can be the perfect solution for your business. www.office hub.com.au www.office hub.co.nz Conditions apply A portion of the square meterage factors in access to shared space. Price includes any incentives offered. This is for new tenants only. A Grade Fitout | Excellent Amenities | Impressive Location $484pw | 2 Person Workspa..
PROPERTY OVERVIEW $484pw Price incl. Polished and professional managed space in affluent Barton location close to Canberra's Parliament House. Price includes: 24/7 Access | Commercial grade internet | Access to meeting and boardrooms | Flexible terms | Access to internal breakout areas | Business lounge | Professional environment | Stunning Reception | Great Natural Light | Premium Serviced Office | A Grade fit out Located and at the footsteps of Parliament House and Government Departments in one of Canberra's newest five star buildings, 18 National Circuit is also nearby Australia's most iconic attractions. The National Gallery of Australia, National Library of Australia, National Portrait Gallery, Questacon Award winning Hotel Realm and Burbury Hotel are all close The advertised office space is perfect for a team of 2. If you need more or less space, we have over 30,000 furnished workspaces all over the world suitable for a team of 1 to 200+. Our award winning team offer a free service that will help you find the perfect solution for your needs, so reach out if you need more help. What you get for your weekly rent Furnished office with desks, chairs and lock up storage units Commercial grade internet service Telephone line and personalised phone answering Use of kitchen facilities with premium coffee/tea service Electricity usage included Complimentary receptionist to meet and greet your clients Prestigious business address Flexible terms from 1 month to long term Ability to bring your existing phone number over Business lounge with complimentary break out areas 24 x 7 Access to your office 24 x 7 security Office features Immaculate fit out and facilities Full mail management and postage Large boardroom and meeting rooms Signage board in foyer to highlight your business name Professional environment Server / Comms rooms available for server storage Building features Modern high rise classified as an "A" grade building 24 x 7 access to your office High speed lifts Car parking in building and surrounding areas Dedicated on site management team The advertised price includes building outgoings and is based on one person occupying the workspace. If you have 2 or more people extra fees will apply to cover off services like telephone, internet and kitchen amenities. 30m to Bus 50m to Gym, Pub and Shopping Centre 5m to Park Ideal location, with everything close by! WHO IS OFFICE HUB? Office Hub is Australia & New Zealands No 1 small office space commercial real estate agency. We have the largest collection of shared spaces, coworking and serviced offices in Australia & New Zealand, perfect for 1 200 employees. Let us take you on a tour of all the spaces that fit your needs and budget. Our service is complimentary and we work for you and the landlord to negotiate the most competitive deal in the market. Let us show you how shared and serviced offices can be the perfect solution for your business. www.office hub.com.au www.office hub.co.nz Conditions apply A portion of the square meterage factors in access to shared space. Price includes any incentives offered. This is for new tenants only. Dedicated Receptionist | Modern Building | Regular Cleaning $573pw | 6 Person Workspa..
PROPERTY OVERVIEW $573pw Price incl. Professional serviced office in Kingston. Price incl. Internet, Telephone, Electricity & Kitchen Flexi terms Regular Cleaning 24/7 access Dedicated receptionist Trendy Canberra Location close to Parliament House Avail NOW for short or long term rent Located in Canberra's popular inner south between the Canberra railway station and the Kingston Powerhouse, this low rise boutique building is only an 8 minutes drive to the CBD. These new developments and the rise of a cafe culture have reformed Kingston as one of the most exclusive suburbs in Canberra. Located in Kingston, Canberra's oldest suburb, this space provides you with a professional and economical total office solution. The advertised office space is perfect for a team of 6. If you need more or less space, we have over 30,000 furnished workspaces all over the world suitable for a team of 1 to 200+. Our award winning team offer a free service that will help you find the perfect solution for your needs, so reach out if you need more help. What you get for your weekly rent Furnished office with desks, chairs and lock up storage units Complimentary receptionist to meet and greet your clients Unlimited commercial grade internet service Electricity usage included Regular cleaning Telephone number & handset Prestigious business address to put on your cards Flexible terms from 1 month 2 years Ability to bring your existing phone number over 24 x 7 access to your office 24 x 7 security Office features Views from selected offices Full mail management and postage Large boardroom and meeting rooms Signage board in foyer to highlight your business name (fees apply) Server / Comms rooms available for server storage Building features Modern building Food court in building Bike racks and shower facilities High speed lifts Car parking in building and surrounding areas Dedicated on site management team 100m to buses along Giles Street 600m to Canberra Train Station WHO IS OFFICE HUB? Office Hub is Australia & New Zealand\'s No 1 small office space commercial real estate agency. We have the largest collection of shared spaces, coworking and serviced offices in Australia & New Zealand, perfect for 1 100 employees. Let us take you on a tour of all the spaces that fit your needs and budget. Our service is complimentary and we work for you and the landlord to negotiate the most competitive deal in the market. Let us show you how shared and serviced offices can be the perfect solution for your business. www.office hub.com.au www.office hub.co.nz Conditions apply A portion of the square meterage factors in access to shared space. Price includes any incentives offered. This is for new tenants only. A Grade Building | Cafes And Shops Nearby | Prestigious Location $635pw | 5 Person Workspa..
PROPERTY OVERVIEW $635pw Price incl. Cool and high quality Serviced office located next to Canberra Airport. Price incl. Internet, Rent & Building outgoings 24/7 Access Access to meeting and boardrooms Access to internal breakout areas Open plan layout Stunning Reception Located in the ultra modern Brindabella Business Park development, this A Grade building contains a mix of private offices and shared desks in an exciting, cutting edge work environment. Brightly lit and airy with access to NBN internet, this space is well positioned with restaurants, cafes and Canberra International Airport all nearby. The advertised office space is perfect for a team of 5. If you need more or less space, we have over 30,000 furnished workspaces all over the world suitable for a team of 1 to 200+. Our award winning team offer a free service that will help you find the perfect solution for your needs, so reach out if you need more help. What you get for your weekly rent , 24/7 Access , 24/7 Security , Access to internal breakout areas , Access to kitchen facilities , Building outgoings included , Commercial grade internet , Flexible terms , A prestigious address to put on your business cards , Worldwide access to boardrooms, meeting rooms and day offices , Plug and play furnished workspace Building features , Air conditioning , Conference facilities available , Dedicated men and ladies bathrooms , Modern fit out , Natural light , Open plan layout , Private offices , Professional environment , Shared office space , Quick access to major airports 7 minute drive to Majura shopping centre 3.5kms to IKEA Canberra 750m to Canberra Airport WHO IS OFFICE HUB? Office Hub has largest collection of shared office space, sublet office space, creative coworking office space and serviced offices, perfect for 1 200 employees. Let us take you on a tour of all the spaces that fit your needs and budget. Our service is complimentary and we work for you and the landlord to negotiate the most competitive deal in the market. Let us show you how shared and serviced offices can be the perfect solution for your business. All pricing shown excludes any local taxes such as GST or VAT Conditions apply A portion of the square meterage factors in access to shared space. The advertised price includes any incentives offered based on a 12 month agreement. If a shorter period is agreed to please note the price may increase accordingly. This promotional offer for new tenants only and may be withdrawn at any time due to space availability. Dedicated Receptionist | Excellent Amenities | Fully Furnished $175pw | 5 Person Workspa..
PROPERTY OVERVIEW $175pw Price incl. Professional serviced office in Kingston. Price incl. Internet, Telephone, Electricity & Kitchen Flexi terms Regular Cleaning 24/7 access Dedicated receptionist Trendy Canberra Location close to Parliament House Avail NOW for short or long term rent Located in Canberra's popular inner south between the Canberra railway station and the Kingston Powerhouse, this low rise boutique building is only an 8 minutes drive to the CBD. These new developments and the rise of a cafe culture have reformed Kingston as one of the most exclusive suburbs in Canberra. Located in Kingston, Canberra's oldest suburb, this space provides you with a professional and economical total office solution. The advertised work space is perfect for a team of 5. If you need more or less space we have furnished and unfurnished offices ready to go from 10sqm 200sqm all over Australia and New Zealand. What you get for your weekly rent Furnished office with desks, chairs and lock up storage units Complimentary receptionist to meet and greet your clients Unlimited commercial grade internet service Electricity usage included Regular cleaning Telephone number & handset Prestigious business address to put on your cards Flexible terms from 1 month 2 years Ability to bring your existing phone number over 24 x 7 access to your office 24 x 7 security Office features Views from selected offices Full mail management and postage Large boardroom and meeting rooms Signage board in foyer to highlight your business name (fees apply) Server / Comms rooms available for server storage Building features Modern building Food court in building Bike racks and shower facilities High speed lifts Car parking in building and surrounding areas Dedicated on site management team 100m to buses along Giles Street 600m to Canberra Train Station WHO IS OFFICE HUB? Office Hub is Australia & New Zealand\'s No 1 small office space commercial real estate agency. We have the largest collection of shared spaces, coworking and serviced offices in Australia & New Zealand, perfect for 1 100 employees. Let us take you on a tour of all the spaces that fit your needs and budget. Our service is complimentary and we work for you and the landlord to negotiate the most competitive deal in the market. Let us show you how shared and serviced offices can be the perfect solution for your business. www.office hub.com.au www.office hub.co.nz Conditions apply A portion of the square meterage factors in access to shared space. Price includes any incentives offered. This is for new tenants only. Buses Nearby | Fully Furnished | Brightly Lit $140pw | 2 Person Workspa..
PROPERTY OVERVIEW $140pw Price incl. This boutique managed space is a winner for small businesses and individuals alike! Situated in Canberra South, the creative space combines serviced offices, hotdesks and permanent desks in a light and modern open plan workspace. Your team will benefit from dedicated meeting rooms, boardrooms and communal kitchen areas and they’ll love the stylish and light filled open plan design. This managed office space is in the ideal location of Symonston, South Canberra, close to the Canberra Outlet Centre and Mill Creek Oval, just 6.4km from the city centre with excellent road and public transport links. Symonston is a primarily industrial and agricultural suburb of Canberra so this location may suit a business operating in these industries. The modern office building has disabled access, in built and street parking, a great little cafe and 24/7 CCTV monitoring. There are shower and kitchen facilities as well as mail handling services and a pet friendly policy. The advertised work space is perfect for a team of 2. If you need more or less space we have furnished and unfurnished offices ready to go from 10sqm 200sqm all over Australia and New Zealand. What you get for your weekly rent , 24/7 Access , Access to internal breakout areas , Commercial grade internet , Electricity usage included , Flexible terms , Premium Coffee/Tea Facilities , Fully equipped boardrooms, meeting rooms and day offices (fees may apply) , Plug and play furnished workspace , One simple bill for everything related to your workspace , FREE business networking events , Collaborative space with a great community feel Building features , Air conditioning , Dedicated men and ladies bathrooms , Disabled facilities , Modern fit out , Natural light , Showers , Modern communal food preparation areas , Car parking in building (Paid) , Car parking Street (Free) , Pet friendly office space , Creative co working space Multiple bus links within 600m 11km from Canberra Airport Close to cafes and bars of Manuka and Kingston Road access from Canberra Avenue Parking available WHO IS OFFICE HUB? Office Hub has largest collection of shared office space, sublet office space, creative coworking office space and serviced offices, perfect for 1 200 employees. Let us take you on a tour of all the spaces that fit your needs and budget. Our service is complimentary and we work for you and the landlord to negotiate the most competitive deal in the market. Let us show you how shared and serviced offices can be the perfect solution for your business. www.office hub.com.au www.office hub.co.nz Conditions apply A portion of the square meterage factors in access to shared space. The advertised price includes any incentives offered based on a 12 month agreement. If a shorter period is agreed to please note the price may increase accordingly. This promotional offer for new tenants only and may be withdrawn at any time due to space availability. Regular Cleaning | Trendy Location | Dedicated Receptionist $653pw | 5 Person Workspa..
PROPERTY OVERVIEW $653pw Price incl. Professional serviced office in Kingston. Price incl. Internet, Telephone, Electricity & Kitchen Flexi terms Regular Cleaning 24/7 access Dedicated receptionist Trendy Canberra Location close to Parliament House Avail NOW for short or long term rent Located in Canberra's popular inner south between the Canberra railway station and the Kingston Powerhouse, this low rise boutique building is only an 8 minutes drive to the CBD. These new developments and the rise of a cafe culture have reformed Kingston as one of the most exclusive suburbs in Canberra. Located in Kingston, Canberra's oldest suburb, this space provides you with a professional and economical total office solution. The advertised work space is perfect for a team of 5. If you need more or less space we have furnished and unfurnished offices ready to go from 10sqm 200sqm all over Australia and New Zealand. What you get for your weekly rent Furnished office with desks, chairs and lock up storage units Complimentary receptionist to meet and greet your clients Unlimited commercial grade internet service Electricity usage included Regular cleaning Telephone number & handset Prestigious business address to put on your cards Flexible terms from 1 month 2 years Ability to bring your existing phone number over 24 x 7 access to your office 24 x 7 security Office features Views from selected offices Full mail management and postage Large boardroom and meeting rooms Signage board in foyer to highlight your business name (fees apply) Server / Comms rooms available for server storage Building features Modern building Food court in building Bike racks and shower facilities High speed lifts Car parking in building and surrounding areas Dedicated on site management team 100m to buses along Giles Street 600m to Canberra Train Station WHO IS OFFICE HUB? Office Hub is Australia & New Zealand\'s No 1 small office space commercial real estate agency. We have the largest collection of shared spaces, coworking and serviced offices in Australia & New Zealand, perfect for 1 100 employees. Let us take you on a tour of all the spaces that fit your needs and budget. Our service is complimentary and we work for you and the landlord to negotiate the most competitive deal in the market. Let us show you how shared and serviced offices can be the perfect solution for your business. www.office hub.com.au www.office hub.co.nz Conditions apply A portion of the square meterage factors in access to shared space. Price includes any incentives offered. This is for new tenants only. Natural Light | Cafes And Shops Nearby | Prestigious Location $1519pw | 8 Person Worksp..
PROPERTY OVERVIEW $1519pw Price incl. Cool and high quality Serviced office located next to Canberra Airport. Price incl. Internet, Rent & Building outgoings 24/7 Access Access to meeting and boardrooms Access to internal breakout areas Open plan layout Stunning Reception Located in the ultra modern Brindabella Business Park development, this A Grade building contains a mix of private offices and shared desks in an exciting, cutting edge work environment. Brightly lit and airy with access to NBN internet, this space is well positioned with restaurants, cafes and Canberra International Airport all nearby. The advertised office space is perfect for a team of 8. If you need more or less space, we have over 30,000 furnished workspaces all over the world suitable for a team of 1 to 200+. Our award winning team offer a free service that will help you find the perfect solution for your needs, so reach out if you need more help. What you get for your weekly rent , 24/7 Access , 24/7 Security , Access to internal breakout areas , Access to kitchen facilities , Building outgoings included , Commercial grade internet , Flexible terms , A prestigious address to put on your business cards , Worldwide access to boardrooms, meeting rooms and day offices , Plug and play furnished workspace Building features , Air conditioning , Conference facilities available , Dedicated men and ladies bathrooms , Modern fit out , Natural light , Open plan layout , Private offices , Professional environment , Shared office space , Quick access to major airports 7 minute drive to Majura shopping centre 3.5kms to IKEA Canberra 750m to Canberra Airport WHO IS OFFICE HUB? Office Hub has largest collection of shared office space, sublet office space, creative coworking office space and serviced offices, perfect for 1 200 employees. Let us take you on a tour of all the spaces that fit your needs and budget. Our service is complimentary and we work for you and the landlord to negotiate the most competitive deal in the market. Let us show you how shared and serviced offices can be the perfect solution for your business. All pricing shown excludes any local taxes such as GST or VAT Conditions apply A portion of the square meterage factors in access to shared space. The advertised price includes any incentives offered based on a 12 month agreement. If a shorter period is agreed to please note the price may increase accordingly. This promotional offer for new tenants only and may be withdrawn at any time due to space availability. Abundance Of Natural Light | Transport Close By | A Grade Building $126pw | 1 Person Workspa..
PROPERTY OVERVIEW $126pw Price incl. Cool and high quality Serviced office located next to Canberra Airport. Price incl. Internet, Rent & Building outgoings 24/7 Access Access to meeting and boardrooms Access to internal breakout areas Open plan layout Stunning Reception Located in the ultra modern Brindabella Business Park development, this A Grade building contains a mix of private offices and shared desks in an exciting, cutting edge work environment. Brightly lit and airy with access to NBN internet, this space is well positioned with restaurants, cafes and Canberra International Airport all nearby. The advertised office space is perfect for a team of 1. If you need more or less space, we have over 30,000 furnished workspaces all over the world suitable for a team of 1 to 200+. Our award winning team offer a free service that will help you find the perfect solution for your needs, so reach out if you need more help. What you get for your weekly rent , 24/7 Access , 24/7 Security , Access to internal breakout areas , Access to kitchen facilities , Building outgoings included , Commercial grade internet , Flexible terms , A prestigious address to put on your business cards , Worldwide access to boardrooms, meeting rooms and day offices , Plug and play furnished workspace Building features , Air conditioning , Conference facilities available , Dedicated men and ladies bathrooms , Modern fit out , Natural light , Open plan layout , Private offices , Professional environment , Shared office space , Quick access to major airports 7 minute drive to Majura shopping centre 3.5kms to IKEA Canberra 750m to Canberra Airport WHO IS OFFICE HUB? Office Hub has largest collection of shared office space, sublet office space, creative coworking office space and serviced offices, perfect for 1 200 employees. Let us take you on a tour of all the spaces that fit your needs and budget. Our service is complimentary and we work for you and the landlord to negotiate the most competitive deal in the market. Let us show you how shared and serviced offices can be the perfect solution for your business. www.office hub.com.au www.office hub.co.nz Conditions apply A portion of the square meterage factors in access to shared space. The advertised price includes any incentives offered based on a 12 month agreement. If a shorter period is agreed to please note the price may increase accordingly. This promotional offer for new tenants only. Abundance Of Natural Light | Transport Close By | A Grade Building $232pw | 2 Person Workspa..
PROPERTY OVERVIEW $232pw Price incl. Cool and high quality Serviced office located next to Canberra Airport. Price incl. Internet, Rent & Building outgoings 24/7 Access Access to meeting and boardrooms Access to internal breakout areas Open plan layout Stunning Reception Located in the ultra modern Brindabella Business Park development, this A Grade building contains a mix of private offices and shared desks in an exciting, cutting edge work environment. Brightly lit and airy with access to NBN internet, this space is well positioned with restaurants, cafes and Canberra International Airport all nearby. The advertised office space is perfect for a team of 2. If you need more or less space, we have over 30,000 furnished workspaces all over the world suitable for a team of 1 to 200+. Our award winning team offer a free service that will help you find the perfect solution for your needs, so reach out if you need more help. What you get for your weekly rent , 24/7 Access , 24/7 Security , Access to internal breakout areas , Access to kitchen facilities , Building outgoings included , Commercial grade internet , Flexible terms , A prestigious address to put on your business cards , Worldwide access to boardrooms, meeting rooms and day offices , Plug and play furnished workspace Building features , Air conditioning , Conference facilities available , Dedicated men and ladies bathrooms , Modern fit out , Natural light , Open plan layout , Private offices , Professional environment , Shared office space , Quick access to major airports 7 minute drive to Majura shopping centre 3.5kms to IKEA Canberra 750m to Canberra Airport WHO IS OFFICE HUB? Office Hub has largest collection of shared office space, sublet office space, creative coworking office space and serviced offices, perfect for 1 200 employees. Let us take you on a tour of all the spaces that fit your needs and budget. Our service is complimentary and we work for you and the landlord to negotiate the most competitive deal in the market. Let us show you how shared and serviced offices can be the perfect solution for your business. www.office hub.com.au www.office hub.co.nz Conditions apply A portion of the square meterage factors in access to shared space. The advertised price includes any incentives offered based on a 12 month agreement. If a shorter period is agreed to please note the price may increase accordingly. This promotional offer for new tenants only. 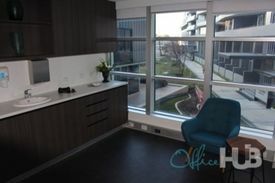 4-person Plug And Play Workspace With Abundant Natural Light All-inclusive $924 weekly.. Spacious Working Environment | Convenient Location | Spectacular Views $1519pw | 9 Person Worksp..
PROPERTY OVERVIEW $1519pw Price incl. Cool and high quality Serviced office located next to Canberra Airport. Price incl. Internet, Rent & Building outgoings 24/7 Access Access to meeting and boardrooms Access to internal breakout areas Open plan layout Stunning Reception Located in the ultra modern Brindabella Business Park development, this A Grade building contains a mix of private offices and shared desks in an exciting, cutting edge work environment. Brightly lit and airy with access to NBN internet, this space is well positioned with restaurants, cafes and Canberra International Airport all nearby. The advertised office space is perfect for a team of 9. If you need more or less space, we have over 30,000 furnished workspaces all over the world suitable for a team of 1 to 200+. Our award winning team offer a free service that will help you find the perfect solution for your needs, so reach out if you need more help. What you get for your weekly rent , 24/7 Access , 24/7 Security , Access to internal breakout areas , Access to kitchen facilities , Building outgoings included , Commercial grade internet , Flexible terms , A prestigious address to put on your business cards , Worldwide access to boardrooms, meeting rooms and day offices , Plug and play furnished workspace Building features , Air conditioning , Conference facilities available , Dedicated men and ladies bathrooms , Modern fit out , Natural light , Open plan layout , Private offices , Professional environment , Shared office space , Quick access to major airports 7 minute drive to Majura shopping centre 3.5kms to IKEA Canberra 750m to Canberra Airport WHO IS OFFICE HUB? Office Hub has largest collection of shared office space, sublet office space, creative coworking office space and serviced offices, perfect for 1 200 employees. Let us take you on a tour of all the spaces that fit your needs and budget. Our service is complimentary and we work for you and the landlord to negotiate the most competitive deal in the market. Let us show you how shared and serviced offices can be the perfect solution for your business. www.office hub.com.au www.office hub.co.nz Conditions apply A portion of the square meterage factors in access to shared space. The advertised price includes any incentives offered based on a 12 month agreement. If a shorter period is agreed to please note the price may increase accordingly. This promotional offer for new tenants only. Filtered Light | Premium Fit Out | Great Location $382pw | 3 Person Workspa..
PROPERTY OVERVIEW $382pw Price incl. Cool and high quality Serviced office located next to Canberra Airport. Price incl. Internet, Rent & Building outgoings 24/7 Access Access to meeting and boardrooms Access to internal breakout areas Open plan layout Stunning Reception Located in the ultra modern Brindabella Business Park development, this A Grade building contains a mix of private offices and shared desks in an exciting, cutting edge work environment. Brightly lit and airy with access to NBN internet, this space is well positioned with restaurants, cafes and Canberra International Airport all nearby. The advertised work space is perfect for a team of 3. If you need more or less space we have furnished and unfurnished offices ready to go from 10sqm 200sqm all over Australia and New Zealand. What you get for your weekly rent , 24/7 Access , 24/7 Security , Access to internal breakout areas , Access to kitchen facilities , Building outgoings included , Commercial grade internet , Flexible terms , A prestigious address to put on your business cards , Worldwide access to boardrooms, meeting rooms and day offices , Plug and play furnished workspace Building features , Air conditioning , Conference facilities available , Dedicated men and ladies bathrooms , Modern fit out , Natural light , Open plan layout , Private offices , Professional environment , Shared office space , Quick access to major airports 7 minute drive to Majura shopping centre 3.5kms to IKEA Canberra 750m to Canberra Airport WHO IS OFFICE HUB? Office Hub has largest collection of shared office space, sublet office space, creative coworking office space and serviced offices, perfect for 1 200 employees. Let us take you on a tour of all the spaces that fit your needs and budget. Our service is complimentary and we work for you and the landlord to negotiate the most competitive deal in the market. Let us show you how shared and serviced offices can be the perfect solution for your business. www.office hub.com.au www.office hub.co.nz Conditions apply A portion of the square meterage factors in access to shared space. The advertised price includes any incentives offered based on a 12 month agreement. If a shorter period is agreed to please note the price may increase accordingly. This promotional offer for new tenants only. $1414pw | 10 Person Works..
PROPERTY OVERVIEW $1414pw Price incl. Polished and professional managed space in affluent Barton location close to Canberra's Parliament House. Price includes: 24/7 Access | Commercial grade internet | Access to meeting and boardrooms | Flexible terms | Access to internal breakout areas | Business lounge | Professional environment | Stunning Reception | Great Natural Light | Premium Serviced Office | A Grade fit out Located and at the footsteps of Parliament House and Government Departments in one of Canberra's newest five star buildings, 18 National Circuit is also nearby Australia's most iconic attractions. The National Gallery of Australia, National Library of Australia, National Portrait Gallery, Questacon Award winning Hotel Realm and Burbury Hotel are all close The advertised office space is perfect for a team of 10. If you need more or less space, we have over 30,000 furnished workspaces all over the world suitable for a team of 1 to 200+. Our award winning team offer a free service that will help you find the perfect solution for your needs, so reach out if you need more help. What you get for your weekly rent Furnished office with desks, chairs and lock up storage units Commercial grade internet service Telephone line and personalised phone answering Use of kitchen facilities with premium coffee/tea service Electricity usage included Complimentary receptionist to meet and greet your clients Prestigious business address Flexible terms from 1 month to long term Ability to bring your existing phone number over Business lounge with complimentary break out areas 24 x 7 Access to your office 24 x 7 security Office features Immaculate fit out and facilities Full mail management and postage Large boardroom and meeting rooms Signage board in foyer to highlight your business name Professional environment Server / Comms rooms available for server storage Building features Modern high rise classified as an "A" grade building 24 x 7 access to your office High speed lifts Car parking in building and surrounding areas Dedicated on site management team The advertised price includes building outgoings and is based on one person occupying the workspace. If you have 2 or more people extra fees will apply to cover off services like telephone, internet and kitchen amenities. 30m to Bus 50m to Gym, Pub and Shopping Centre 5m to Park Ideal location, with everything close by! WHO IS OFFICE HUB? Office Hub is Australia & New Zealand\'s No 1 small office space commercial real estate agency. We have the largest collection of shared spaces, coworking and serviced offices in Australia & New Zealand, perfect for 1 100 employees. Let us take you on a tour of all the spaces that fit your needs and budget. Our service is complimentary and we work for you and the landlord to negotiate the most competitive deal in the market. 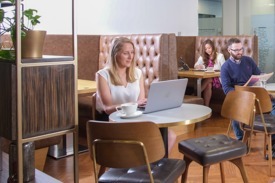 Let us show you how shared and serviced offices can be the perfect solution for your business. www.office hub.com.au www.office hub.co.nz Conditions apply A portion of the square meterage factors in access to shared space. Price includes any incentives offered. This is for new tenants only.